Friends’ tradition of joyful music making is reflected in the passion and enthusiasm of our outstanding faculty, and in the seriousness of purpose with which our students approach each performance. It is echoed in the Schoolwide lifting of voices at Convocation; and in the upbeat tempos of the Jazz Ensemble. Quite simply, music at Friends is Community – a cherished aspect of School life that inspires and connects us to one another and to people everywhere. 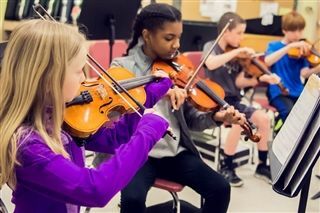 Students learn music skills and literacy through a variety of activities that include singing, playing instruments, rhythmic movement, and games. In addition to general music, our 3rd graders explore various brass, string and woodwind instruments, selecting one to study and to perform in 4th and 5th Grade Band or Orchestra. 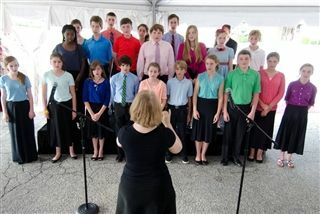 The students showcase their music abilities in concerts held twice each year, in the winter and again in the spring. 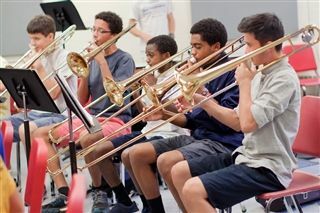 Middle School classes build on students’ musicianship through sight-singing, song writing and other exercises designed to prepare them for higher level improvisations and cross-cultural engagement. Students have the opportunity to participate in chorus, band and orchestra, as well as Fiddle Club and the audition-only chamber choir, Apollos. All Middle School ensembles perform at least two concerts a year, in the winter and again in the spring. Upper Schoolers create and perform music through a host of ensembles, including the Concert Chorale, the Chamber Choir, Orchestra, Jazz Ensemble, and Wind Ensemble. These groups perform in concert twice a year, in the winter and again in the spring. Outside of the classroom students may pursue additional performance opportunities through the a cappella singing groups the Quaketones and the Pleiades, as well as the Acoustic Music Club, and student-led Coffee Houses. Electives such as Music Theory, Music History, and Digital Audio provide a deeper dive into areas of interest. For children of all ages at Friends, the joy of making music spills over to after-school hours. Many opt to take private music lessons (piano, guitar, voice, strings, winds, brass, percussion) taught on campus by area musicians.